As millions of Americans struggle to find work in the wake of the Great Recession, politicians from both parties look to regulation in search of an economic cure. Some claim that burdensome regulations undermine private sector competitiveness and job growth, while others argue that tough new regulations actually create jobs at the same time that they provide other benefits. Does Regulation Kill Jobs? reveals the complex reality of regulation that supports neither partisan view. Leading legal scholars, economists, political scientists, and policy analysts show that individual regulations can at times induce employment shifts across firms, sectors, and regions — but regulation overall is neither a prime job killer nor a key job creator. The challenge for policymakers is to look carefully at individual regulatory proposals to discern any job shifting they may cause and then to make regulatory decisions sensitive to anticipated employment effects. Drawing on their analyses, contributors recommend methods for obtaining better estimates of job impacts when evaluating regulatory costs and benefits. They also assess possible ways of reforming regulatory institutions and processes to take better account of employment effects in policy decision-making. Does Regulation Kill Jobs? tackles what has become a heated partisan issue with exactly the kind of careful analysis policymakers need in order to make better policy decisions, providing insights that will benefit both politicians and citizens who seek economic growth as well as the protection of public health and safety, financial security, environmental sustainability, and other civic goals. Matthew D. Adler • Joseph E. Aldy • Christopher Carrigan • Cary Coglianese • E. Donald Elliott • Rolf Färe • Ann Ferris • Adam M. Finkel • Wayne B. Gray • Shawna Grosskopf • Michael A. Livermore • Brian F. Mannix • Jonathan S. Masur • Al McGartland • Richard Morgenstern • Carl A. Pasurka • Jr. • William A. Pizer • Eric A. Posner • Lisa A. Robinson • Jason A. Schwartz • Ronald J. Shadbegian • Stuart Shapiro. What people are saying about the book Does Regulation Kill Jobs? "Few public policy choices are more difficult than those involving the regulation of the private sector. Compliance can be expensive, perhaps leading to a loss in both jobs and productivity, but regulation can also generate important benefits, such as safer workplaces and products. Does Regulation Kill Jobs? offers important guidance for making difficult regulatory tradeoffs and sorting through competing persuasive arguments. Drawing on work by eminent scholars and practitioners, this excellent book should be required reading for every member of Congress and every state legislator, as well as for the men and women in government agencies who draft rules, so they can better understand how to increase regulation’s benefits and minimize its adverse impacts on employment." "Does Regulation Kill Jobs? provides a balanced perspective with novel insights about the connection between regulation and jobs. Offering new evidence that regulation generally causes little or no net change in national employment, the book nevertheless makes a compelling case for the need to incorporate job impacts more fully into decisions about specific regulations." 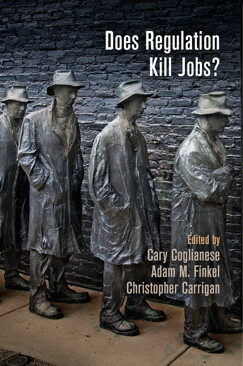 "This superb book answers the important question posed by its title in a careful and highly nuanced manner: regulations do not ‘kill’ jobs in the cataclysmic ways sometimes implied in today’s shrill political debate, but they do at times have impacts on employment that can affect workers’ well-being and should be taken into account in order to make better regulatory decisions." "Does Regulation Kill Jobs? provides an outstanding analysis of what has become the most salient issue for regulatory policy in the wake of the Great Recession."